The Rail Baltica Global Project Procurement Plan is put together in accordance with this phasing. During the planning stage, activities related to route alignment are carried out as well as several major studies in the three Baltic countries. However, some studies of minor importance will also be commissioned during the subsequent phases. 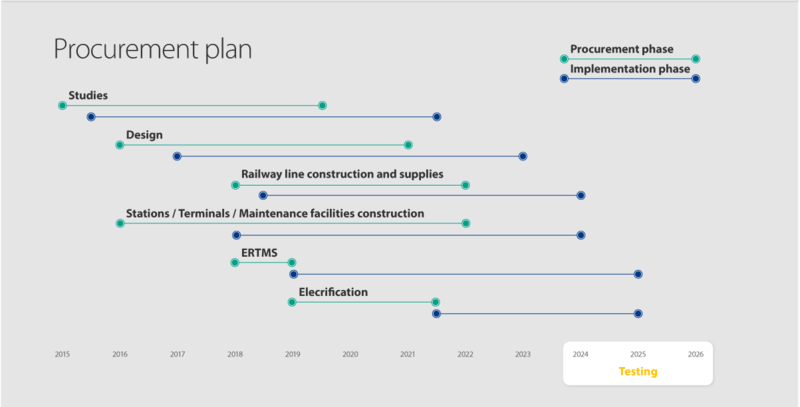 Additionally, the Project’s design and construction phases overlap since some procurements of infrastructure items by Rail Baltica are planned as “Design & Build”. NB! Please take into consideration that the material has been provided for informational purposes only. It is subject to changes or updates during the development of the project.